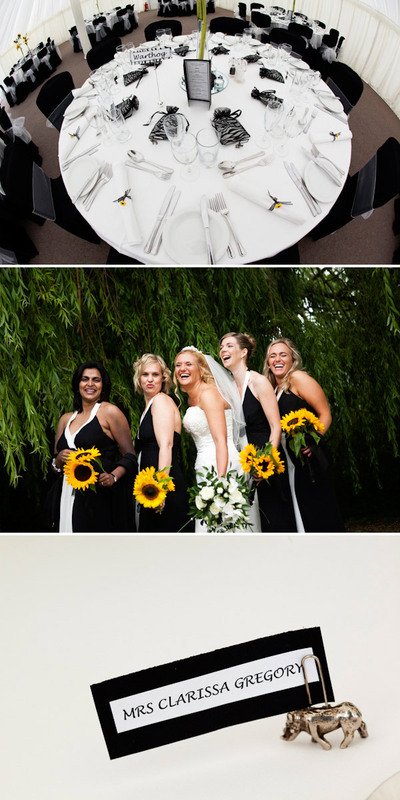 When this wedding popped into my inbox I squealed with excitement. Joe the Groom used to work with my boyfriend you see. At one particular work event I was rabbiting away about weddings to Joe. 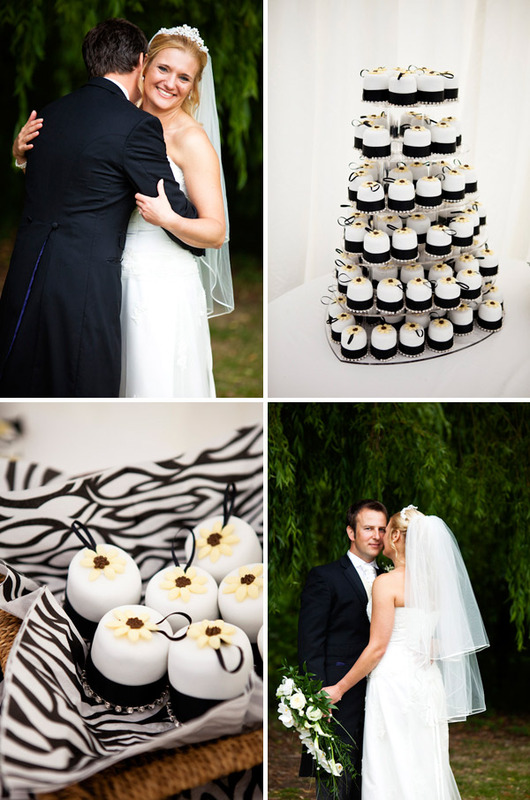 Banging on about how much I wanted to work for this AMAZING blog called Rock My Wedding. At this stage, Joe and Sophie weren’t even engaged and we were all laughing about us ladies putting the pressure on our lovely boys to bite the bullet. Matt and I were thrilled when we heard that Joe had proposed. (Don’t worry lovelies, Sophie will tell you the proposal story). Fast forward a few months; Joe and Sophie are a married couple and I’m putting together their wedding post for that AMAZING blog. It’s a small world. Sophie and Joe’s day is just lovely. 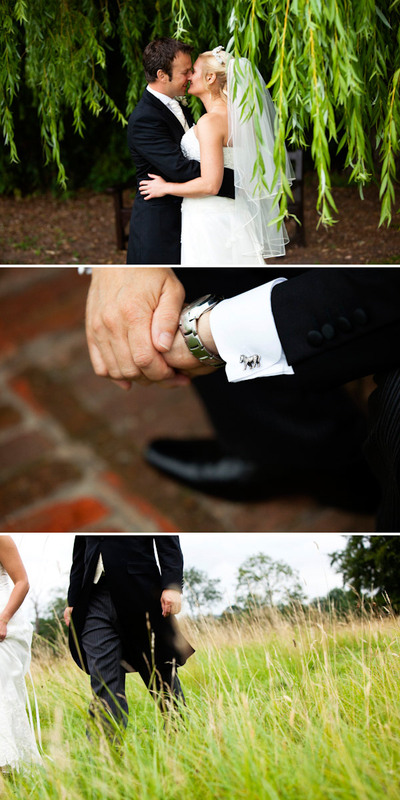 The flowers are a simple combination of white roses and gypsophila. 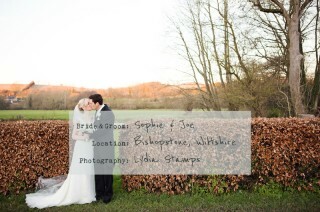 The colour scheme of gold, white and ivy green is beautiful and Sophie’s dress fits her like a glove. 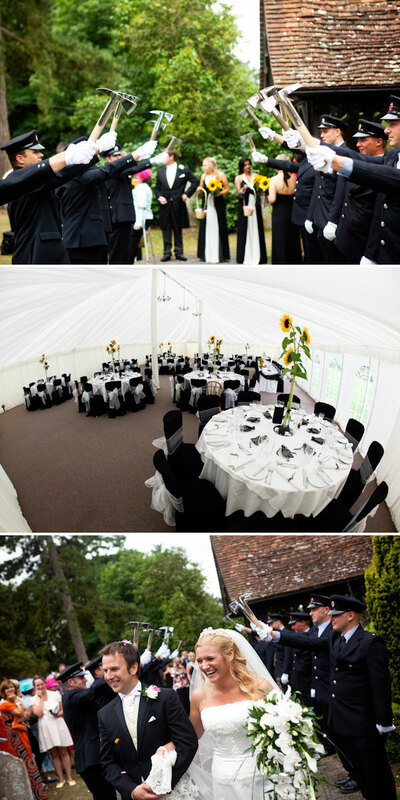 They married at the family church and had a marquee reception filled with fairy lights and dancing. 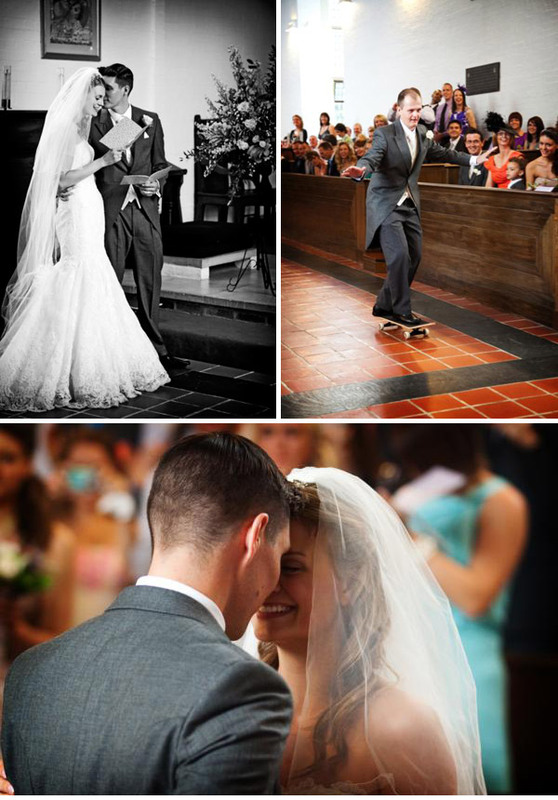 Never in a million years would you be able to tell that they planned their wedding in just six months! 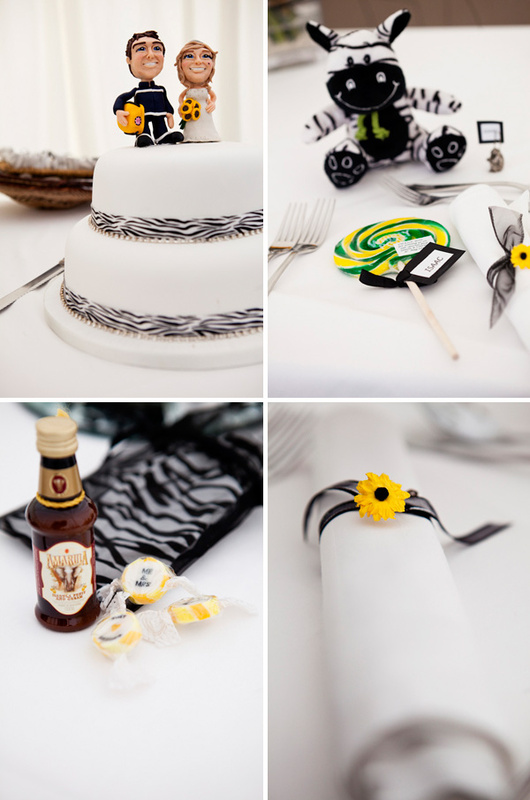 You will also probably be surprised to know that this is a winter wedding! Joe and Sophie lucked out and got one of those crystal-clear-blue-sky winter days that I love. 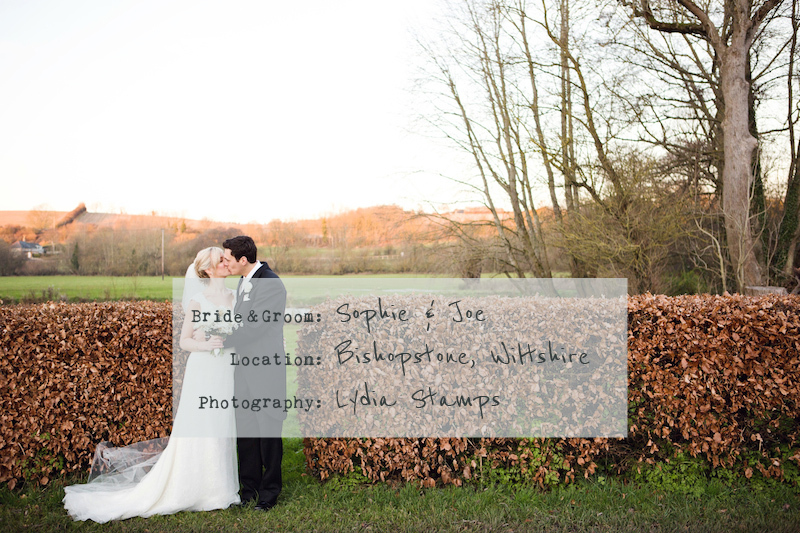 Sophie The Bride: We got married in Bishopstone village church – just steps away from my parent’s house in the heart of the Wiltshire countryside. My elder sister also got married here and it was really special to spend the morning of the wedding in my family home and be able to walk down the lane for the ceremony with my Dad and bridesmaids. The sun even came out for us and Lydia, our photographer, got some amazing snaps! My mum has been getting her hair done by a friend in the village for years – Jayne, who runs a salon called Escape. She used to do my hair too when I lived at home so it felt lovely to ask her to style my hair on the day! By flicking through plenty of wedding mags I knew that I wanted a simple up do, and she came up trumps. My hair was actually above shoulder length but she managed to make it look really long which was brilliant. Jayne’s friend is a makeup artist so I decided to book her for the day as well, to do make-up for me and my mum. She did a great job of keeping it simple, but applying everything so that it looked fresh and lasted all day. I went for a gold shimmer on the eyes and just some gloss on my lips. I also have a friend who is brilliant at hair and makeup so I asked her to come along and help with the bridesmaids. She did a beautiful job and they looked stunning. 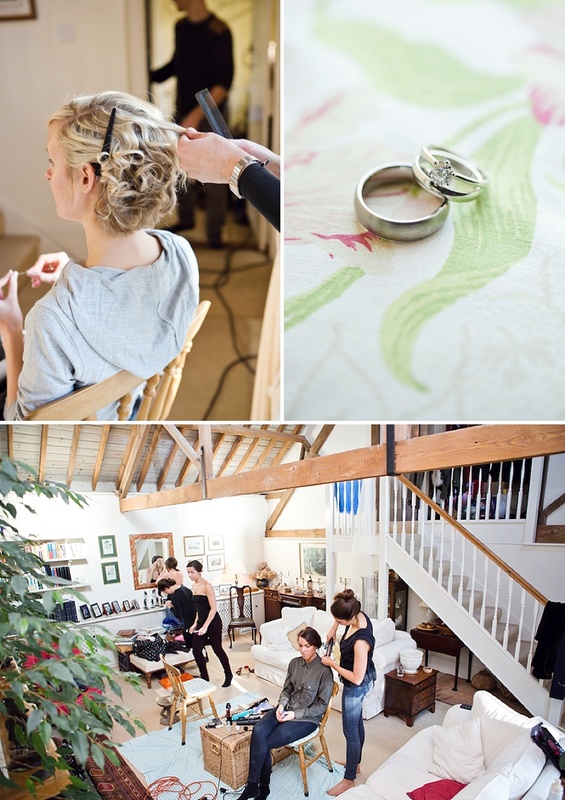 It was lovely to have Lydia there all day to capture us getting ready and setting up some pre-wedding shots. My dress was by Annasul Y and I got it from Teokath in Wimbledon. The only thing I knew was that I didn’t want strapless, and I was immediately drawn to all the lacy dresses in the store. I loved that I hadn’t seen anyone wear a dress like mine, and the key-hole detail in the back was gorgeous. I also loved the puddle train and the bow detail around the waist. It was actually one of the first dresses I tried on but I had to go back three times before I made my order. I was under quite a lot of pressure to make quick decisions (as we planned the whole wedding in less than six months) but this was one decision I wasn’t going to rush! I borrowed my sister’s veil and hair piece on the day (my something borrowed). 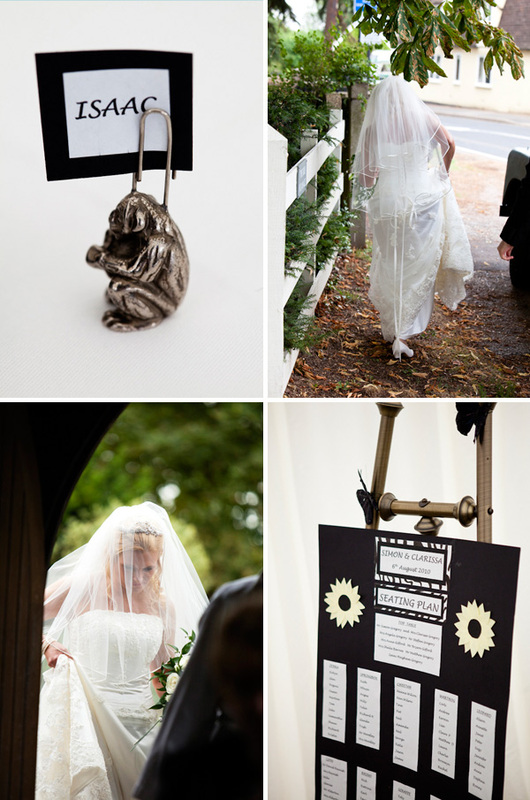 The veil was very plain so didn’t detract from the detail on my dress and trailed out right down past the train. I had to wear flat shoes as the dress wasn’t long enough for heels (which I was fine with – I don’t often wear heels anyway) and choose a very simple pair from Debenhams wedding collection. Sadly my Granny passed away less than a month before the wedding day but I was able to wear a diamond bracelet of hers which was very special. We had a lot of people that we wanted to include in our day so we had quite a large wedding party! I had my younger sister, and three of my best friends as bridesmaids; Joe had his oldest friend Jon as best man and five ushers; and we had two of our nieces as flower girls. The bridesmaid dresses were from Jane Norman (which everyone was really shocked about – they looked a lot more expensive than they were!) and we hired the groomsmen outfits from Moss Bros. They had a great deal on which meant that we got Joe’s entire outfit for free as we ordered more than four groomsmen suits. The flower girl dresses were from Roco Clothing which has a great selection and they are all very reasonably priced. Because it was a winter wedding, we wanted to keep the colours in keeping with the season but NOT Christmassy at all (red was banned from all decor!) The colours we choose were pale gold, white and deep ivy green and we stuck to these for everything – the flowers, the decor and the outfits. 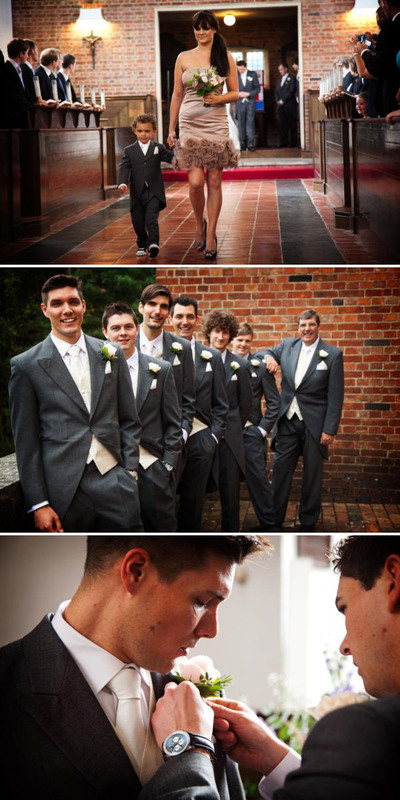 The bridesmaids wore a gorgeous champagne colour and the groomsmen incorporated the green in their outfits. Joe wore a traditional mourning suit but kept it simple in just black and white. We also had lots of candles in the church, and fairy lights at the venue to give the day a cosy festive feel. I wanted to keep the flowers simple. My bouquet was made up of white roses and gypsophila. The church and venue were decorated with white flowers and green ivy – with some gold spray painted twigs entwined throughout. My mum’s friend Daphne is an amazing florist and she did all the arrangements in the church (some huge pedestals as well as smaller arrangements on all the window sills) and wedding party bouquets/button holes and head wreaths (for the flower girls). The venue was decorated by the local village flower club who were amazing and only asked that we pay for the flowers themselves and make a donation to charity. They sourced some amazing flowers for the table decorations (again, all white and green) and some beautiful tall vases that made up our centre pieces. We had a traditional church ceremony which was important to me, and kept the hymns and readings in keeping with that. Two of our readings were biblical, and the third was The Prophet on Marriage by Kahlil Gibran which was beautiful (and we still quote bits of it to each other now!) Saying our vows to each other was definitely the most special part of the day, but it was also nice to disappear into the vestry to sign the register and have a moment in private with our parents. This was the only time we could take photos in the church but Lydia took some beautiful shots and the sunlight coming in through the windows was gorgeous. After the service all our guests lined up outside the church and threw confetti on us as we left to get in our car – it made for some more great pics, although my dress was completely filled with coloured paper! It’s a family tradition to have a Ceilidh dance at a wedding, and we stuck with it! It’s an amazing way of getting everybody up and dancing together and it’s SO much fun. Joe’s sister acted as DJ for us towards the end of the night and the first song she played was Everything by Michael Bublé which is special to Joe and I. At one point in the evening Joe also took me for a walk outside so that we could have a couple of minutes on our own together and reflect on the day and the fact that it was our wedding!! That was a really special moment and one I’ll always remember – I’m glad we had a chance to step back from the craziness of the day and just be with each other. We set up a photo corner in the marquee where guests could pose with fancy dress hats and take some snaps on disposable cameras. Joe loves novelty hats (all of the ones we supplied were his!) and it was fun to be able to capture some relaxed / silly photos of everyone on the day. We also provided a pic n mix table which people could help themselves to throughout the reception. 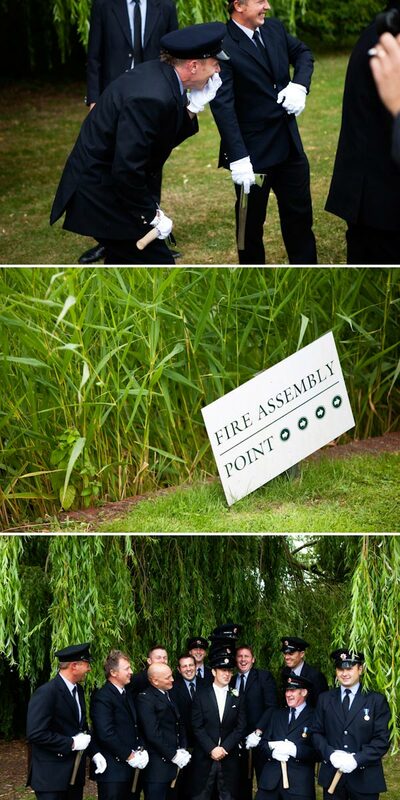 When Joe proposed he did it in the middle of a maze, where he had left a hand-made story book hidden within a massive box of marshmallows, so we had to find a way to incorporate them somehow! (And we both have very sweet tooth!) I would say that the children enjoyed the sweets the most, but I definitely saw the grownups getting involved as well…. Forking Out were our caterers and they provided a mass of canapés for the champagne reception, as well as two courses for the meal; a mushroom starter and pork loin with assorted veg for the main. Everyone complimented the food and there was plenty for everyone to have seconds which was amazing. They also provided a cheese board later in the evening which went down brilliantly and revived all our guests for round two of the dancing! Our cake was made by the Salisbury Chocolate Bar & Patisserie and was a three tiered delicious Belgian chocolate creation decorated with fresh flowers. We cut it before the meal and ate it as our dessert, served with raspberry coulis and cream. Amazing! One of our good friends is a graphic designer and his gift to us was to design and print all of our wedding invitations which was really fantastic. We kept the invites quite traditional but included an RSVP postcard and an information card to try and make life easier for guests. I made the name places myself out of luggage labels (which we tied to the napkins on the table) and hand stamped all the names using an old alphabet stamping kit I had. It took quite a long time but I did a table a night while I was away on a family holiday and actually found it very therapeutic! We named our tables after halls of residence at Loughborough Uni (where Joe and I met) and for the table plan we stamped out the names again and used pegs and an easel to display it all – and then decorated with fresh flowers. Going for an engagement shoot with Lydia was brilliant as it gave Joe and I a chance to get comfortable in front of the camera and try out some poses. We had lots of fun and got some great shots out of it too. 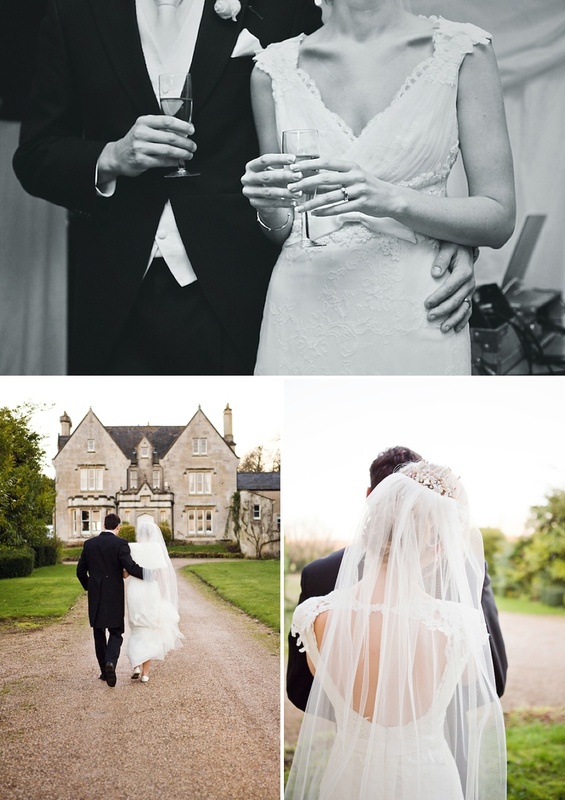 In fact all the photos of the day were brilliant – we were so pleased – and Lydia was really great to work with. She comes highly recommended! As I’ve mentioned, taking some time alone with Joe and going for a quick walk on our own was really special. 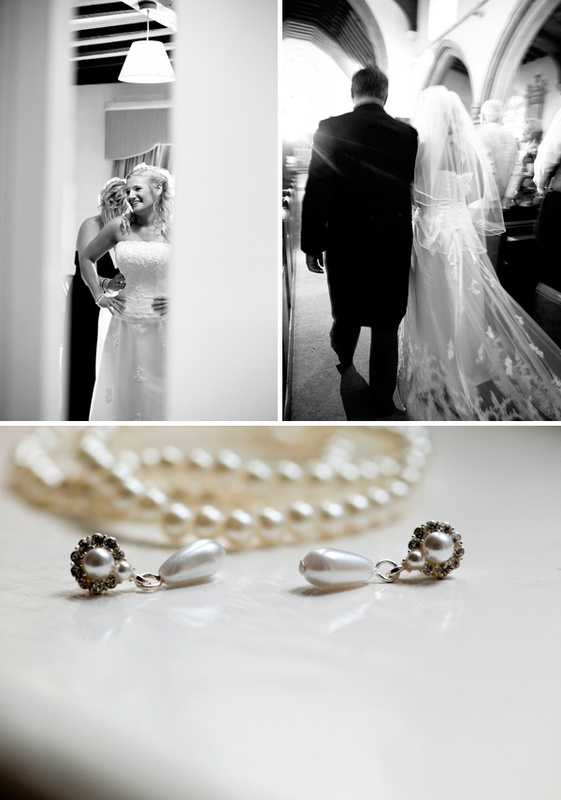 I would definitely recommend couples to take a moment on their wedding day to step back and reflect on what a huge and amazing day they are having. We also loved being able to include so many of our friends and family in the wedding planning. It made the whole day feel personal to us and all the more special. It’s hard to believe this is a December wedding, isn’t it? I’m in love with the table plan. Weddings should be about family and friends and it’s great that Sophie and Joe included so many of theirs in their big day. Todays Rock My Wedding Bride looks just lovely in lace – I’m such a sucker for it and boy does she have the figure to totally rock the frock. 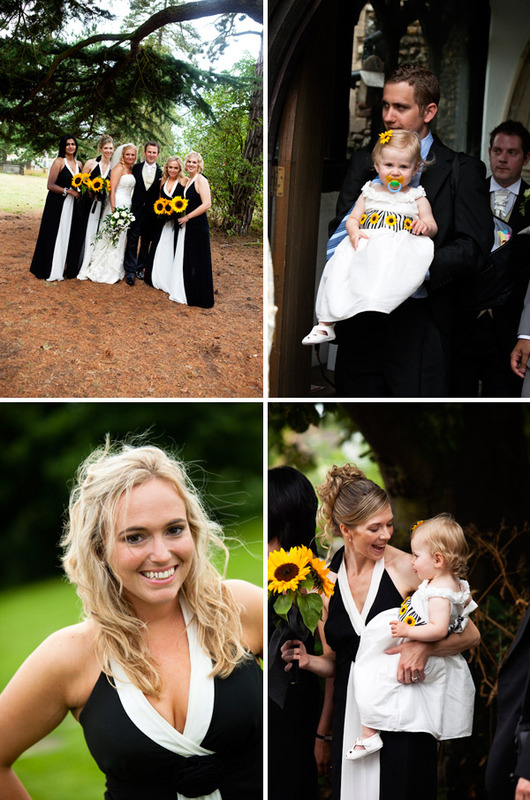 Tim and Laura had a beautifully relaxed day with lots of family help to make it all run smoothly – the absolute best kind I think! And check out the blinging accessories ladies, including (and I never thought I’d say this…) some to-die-for flats! 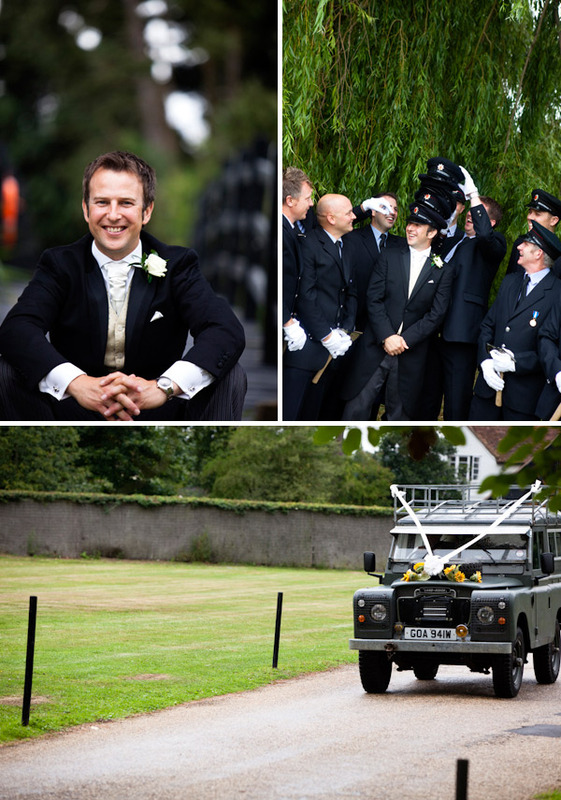 Originally I had envisaged getting married near my parents’ house in Surrey, but there wasn’t really a venue that I felt a particularly special connection to. Exeter University – where Tim and I had met seven years ago — came up in discussion as a possible setting. 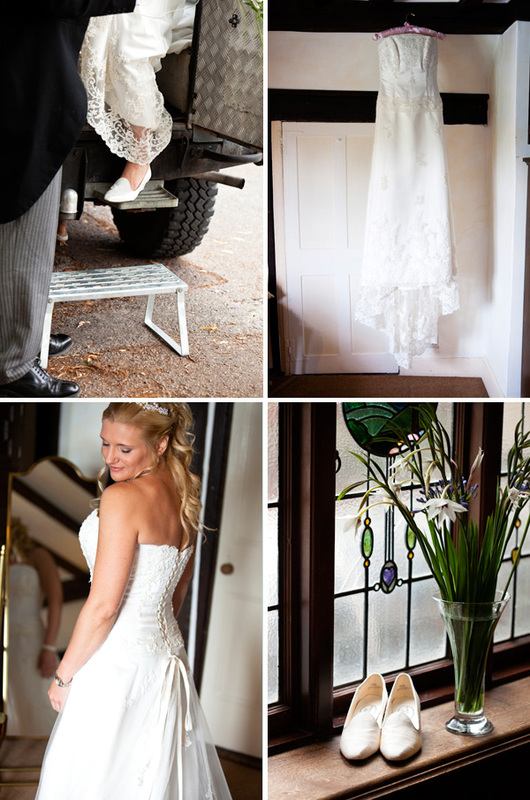 After we returned to view the breathtakingly simple chapel and the gothic looking grounds of Reed Hall, we knew immediately that it was the perfect place. 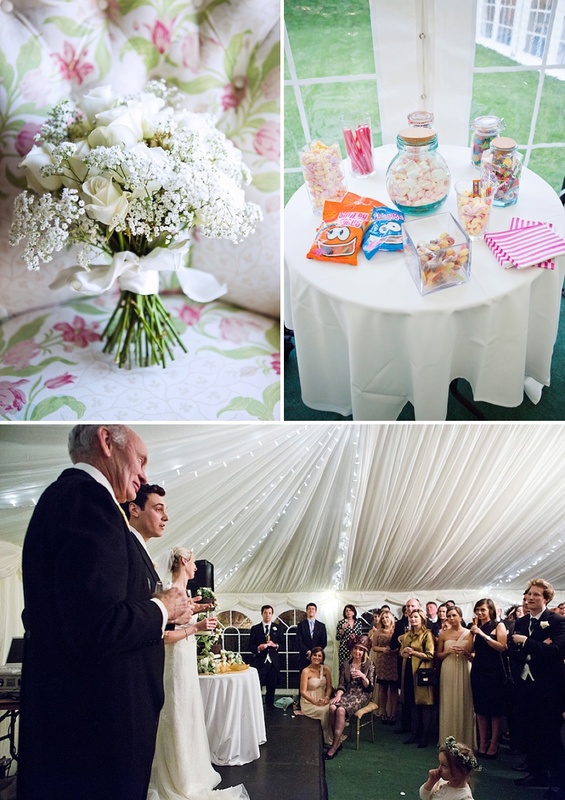 The location instantly brought a sense of “us” to the wedding… and guests could even stay in the very reasonably priced halls of residence because we were booking out of term time! On the Friday night before the wedding, the arriving guests all gathered in the hall bar for beer and pizzas… a real student-style pre-wedding party! 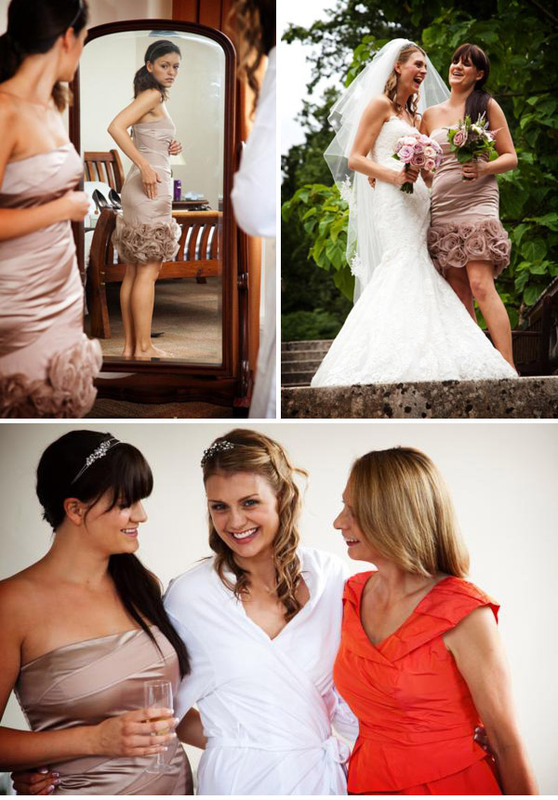 My dress, a Constantina creation by Benjamin Roberts, was the first dress I tried on. I’m so fickle and never really believed that I could fall in love with just one dress, but the second I squeezed into it, I felt so glamorous. It was a fitted drop-waist gown with a fairly long train; tulle with a lace overlay. I tried on a few others just for fun, but I only felt treacherous. Mum wanted me to go for a slightly more traditional princess gown, but I wasn’t swayed… and I’m glad I stuck to my guns. 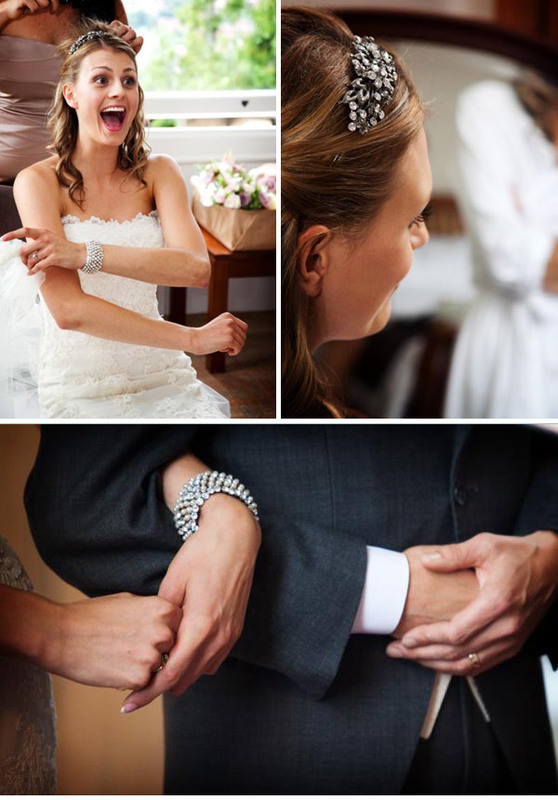 There’s so much pressure on a bride to wait for the one that makes your mum cry… but it’s not her that has to wear it! 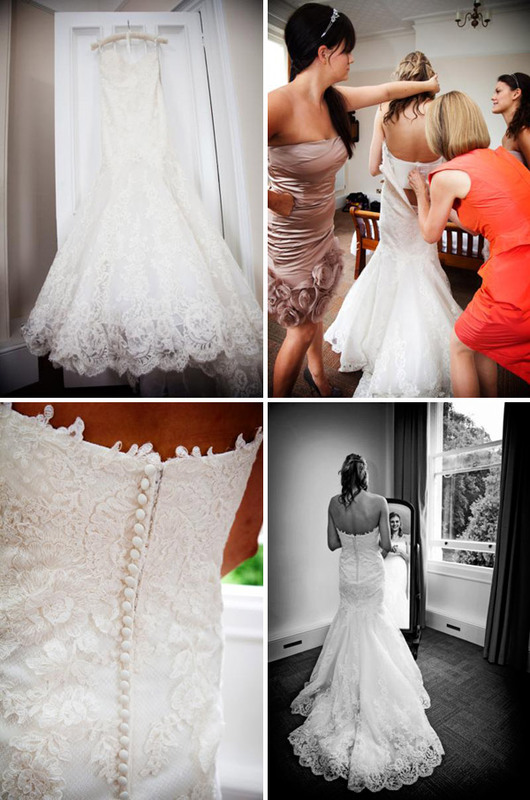 I certainly recommend shopping around once you’ve found your dress, because prices can really vary from shop to shop. 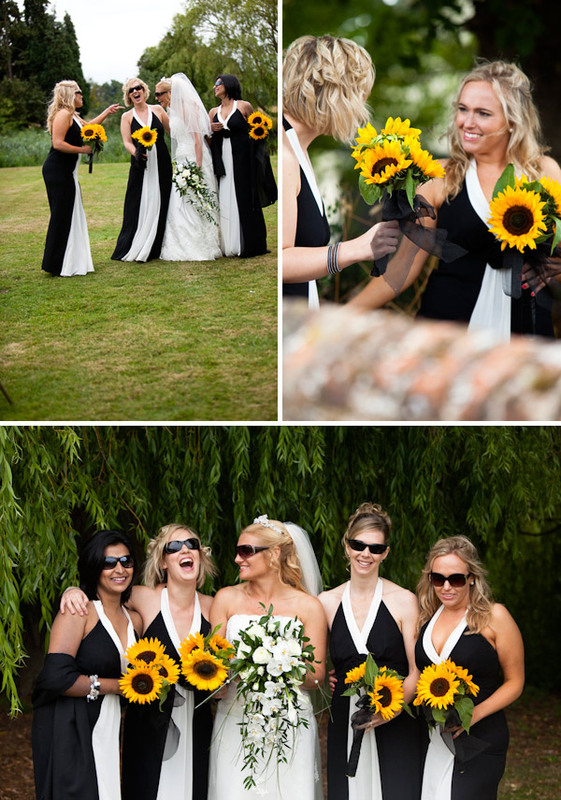 When I originally found the design I wanted, it was in central London and miles out of my price range, but I did my research and found that Surrey Brides in Weybridge stocked the same gown for a whopping £750 cheaper! I couldn’t believe the inconsistency in price. A friend recommended Glitzy Secrets, a fabulous online emporium selling vintage-looking jewellery without the extortionate price-tag, and I found a beautiful tiara in a dull silver colour. They also made smaller versions so I bought those for my bridesmaids to wear. In need of a bit more bling to jazz up my sparkle-free dress, I went for a chunky cuff bracelet from Mikey at Topshop. I loved the idea of a lace veil, but with my dress I knew I could be heading for overkill. In the end I opted for an almost cathedral-length number from Surrey Brides, with small sections of lace embellishment and beading. I had always imagined I’d go for a short veil, but I loved the extra drama that was added by the longer version. I’m 6ft tall and wasn’t keen on towering over everyone on my wedding day, so assuming there wouldn’t be many options available (there never are for me!) I had resigned myself to looking for cream or pink ballet pumps. After a quick window browse in French Sole one lunchtime though, I fell head over flats for a pair of super sparkly ballet pumps, and knew that I’d found a shoe that would do my dress justice. 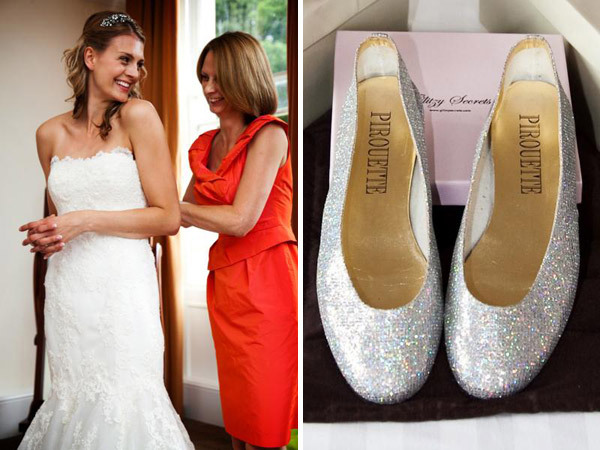 They have a great range called Pirouette, suitable for tall brides with large feet – they actually go up to a size 44 – so I wasn’t destined for clumpy classics! The bridesmaids wore super skyscraper heels from Faith – so they were almost the same height as me on the day! 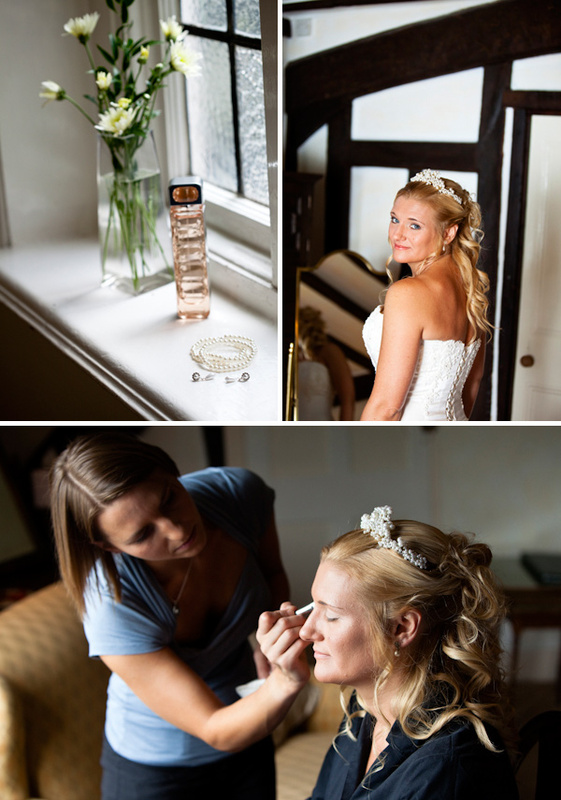 I am very fortunate in that my sister Julie (also a bridesmaid) is a professional hair and make-up artist, and I completely trusted her to do a fantastic job on the day. She knows my style and I was able to do a couple of trials with her beforehand. I wanted my hair to look very natural and a little unkempt, so she created loose waves and twisted a few strands around my tiara. We also had a very fun girly shopping trip to Mac where we spent far too much money selecting the perfect products! It was also very entertaining to conduct some “pretend” hair trials while Tim was in the house, when I’d come out of the room with bird’s nest hair and ask him for his opinion in front of my sister. Genius! I had seen very few bridesmaid dresses that I actually liked, and I knew I wanted something a bit different and not overly “weddingy” for my very stylish ladies. I found these dusky pink dresses in Karen Millen and thought they had the wow-factor. They had the beautiful, faded colour that was continued throughout the stationary, but they were still very cool and contemporary. We hired the suits from Moss Bross, and since our colour theme was so varied, we kept the mens’ suits simple with ivory waistcoats and ties. My 3-year-old nephew Aidan was my page boy, and he walked ahead of me down the aisle looking very grown-up in his Moss Bross suit and cute converse trainers! Tim has always insisted that you can get a perfectly good haircut from the six-pound a go barbers, but for our wedding he was finally persuaded to visit a decent hairdresser! We both love the fashions of the 30s and 40s, and he asked the stylist to cut his hair “a bit like a bad solider cut in WW2”. Amazingly the hairdresser understood just what he meant, and he looked completely gorgeous with his slightly graduated cut and quiff! We were a bit nervous when the reverend at the university chapel told us that he was leaving shortly before our wedding, and drafted in a replacement for us — a retired vicar who hadn’t conducted a wedding in ten years! But we needn’t have worried; Reverend Francis Coles was an enormously fun old chap who was very keen to bring a bit of humour to the wedding. He rang us the week before to ask if any of our friends would be prepared to skateboard into the chapel. He had a bit in his sermon which went along the lines of “marriage is like a skateboard… it can be a bit tricky when you first start”… so one of our ushers kindly agreed to demonstrate for him! The congregation was split into bewilderment and hysterics! Are you not jealous of those curves? Lots more homespun pretty coming right up in Part 2 soon lovelies.